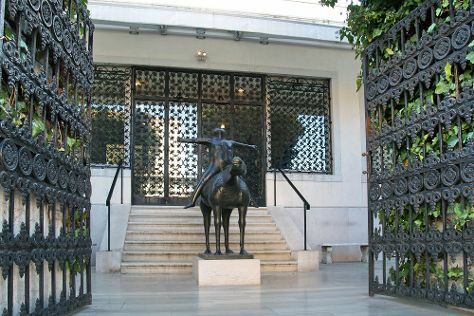 Start off your visit on the 11th (Mon): browse the exhibits of Peggy Guggenheim Collection, explore the activities along Grand Canal, then admire the striking features of St Mark's Campanile, then admire the landmark architecture of Doges' Palace, and finally browse the collection at Museo Correr. On the next day, explore the world behind art at Accademia Gallery, see the interesting displays at Saint Mark's Basilica, steep yourself in history at Bridge of Sighs, then don't miss a visit to St. Mark's Square, and finally examine the collection at Museo Ebraico di Venezia. To see where to stay, maps, reviews, and tourist information, you can read our Venice travel guide. If you are flying in from United Kingdom, the closest major airports are Venice Marco Polo Airport and Treviso-Sant'Angelo Airport. July in Venice sees daily highs of 33°C and lows of 23°C at night.